Revolutionary War Swords have been a favorite of mine since the purchase of my first Potter Horseman's Saber several years ago. 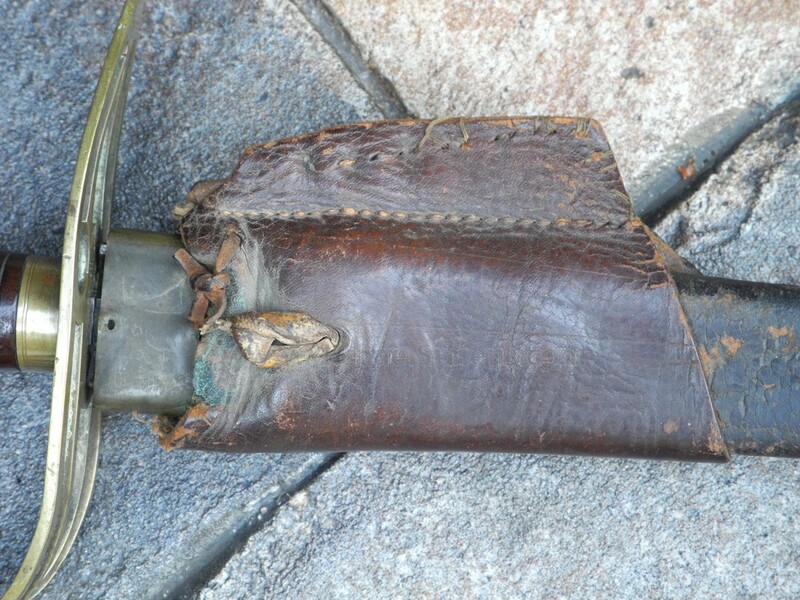 I have only owned a handful of these Revolutionary War Weapons and to find one with its original scabbard is a great rarity. 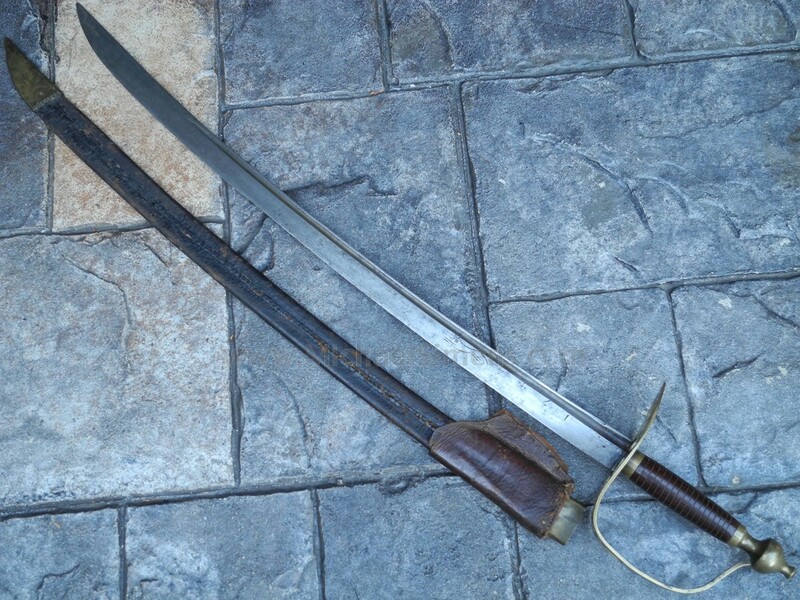 In colonial times, swords were not just a Military item but were also worn and used by civilians. Many such swords had been in families for several generations prior to arriving in the new world, and the variety and age of these weapons varies greatly. The sword, and especially presentation swords have always been a weapon held in high esteem, and it doesn't surprise me that the tradition continues to this very day. 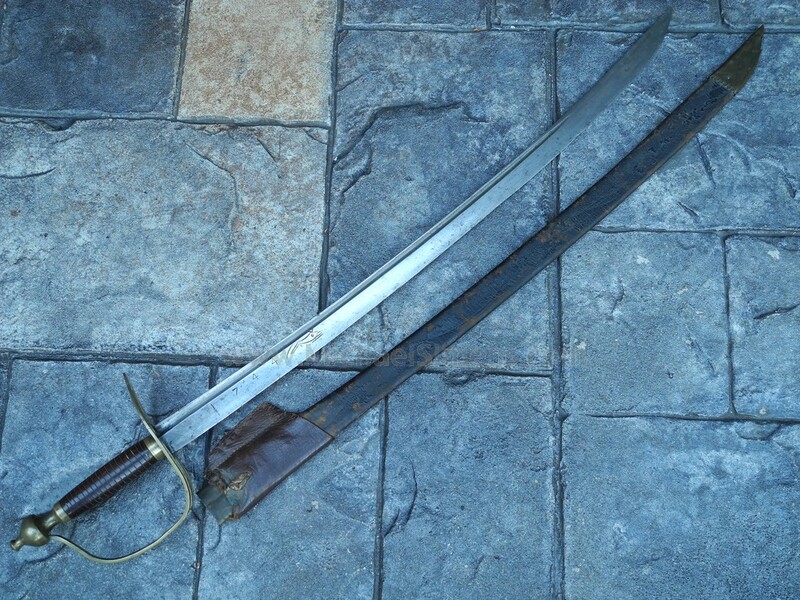 This is a beautiful example of a colonial-made sword with original scabbard. Nearly identical to one pictured on page 351of Neuman's "Battle Weapons of the American Revolution", this sword is 100% original and complete to include its frog. 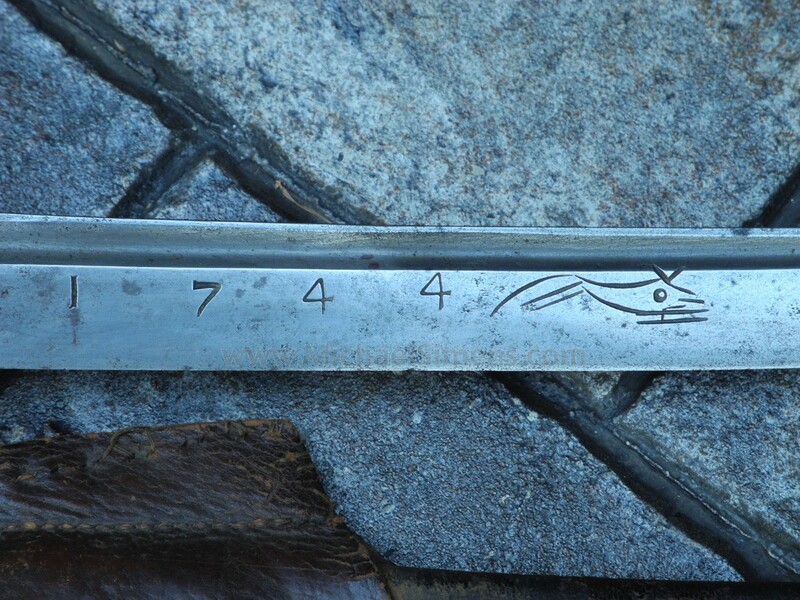 The 26 & 1/2" blade is marked 1744 with a running fox engraved on each side. 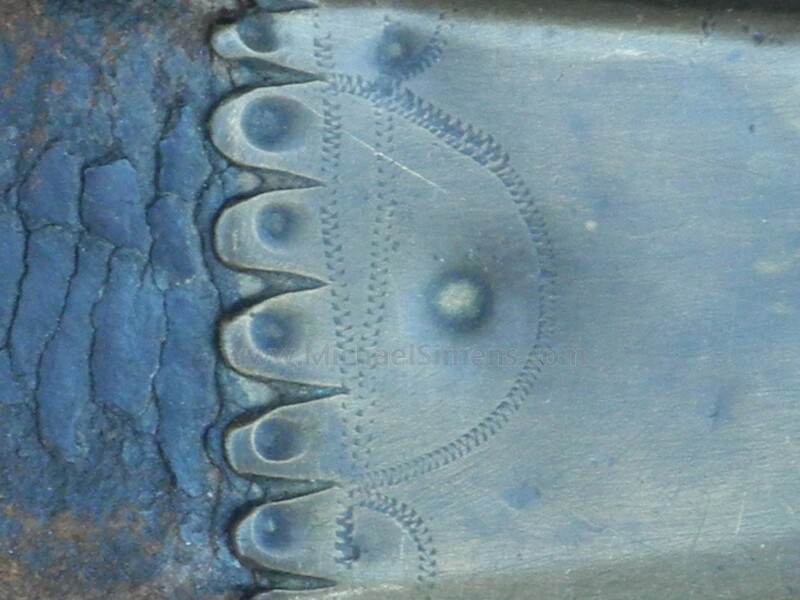 This fox mark was used by German and English blade makers and then copied around the world as a mark of quality. The blade is slightly curved with a single fuller and its beautiful cherry grip is channeled for wire inlay (now missing). 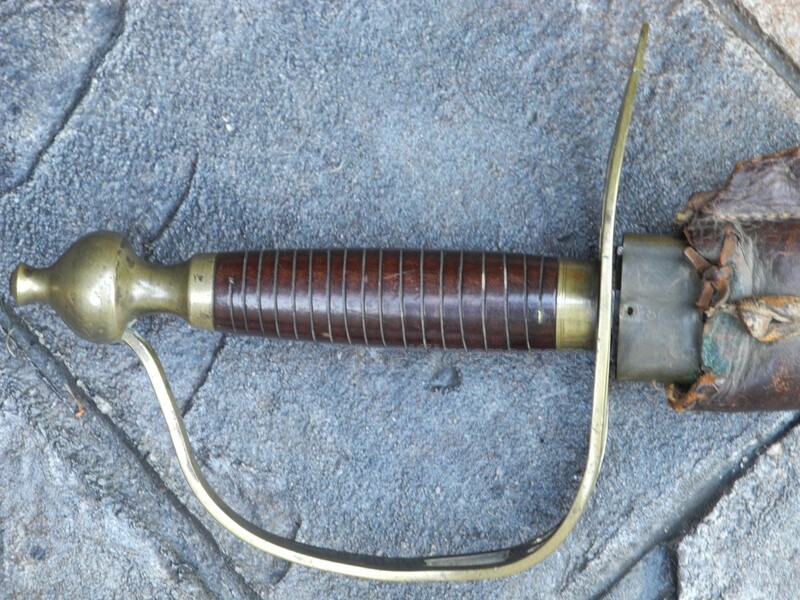 Its sheet-brass guard has been cut to a heart shape providing a folksy, colonial touch and the pommel is a cast mushroom shaped with tall capstan that could easily pierce skin or skull on a properly executed back-swing. The scabbard is back-stitched and the mounts have a super fine engraved border. If you collect weapons or artifacts from other eras and have the means, I would urge you to consider owning one artifact from the time of our founding. I can't think of a better example than a sword such as this and will continue to pursue other weapons from the Revolutionary and Colonial periods for those of you that have shown interest, but can't find anything that suits you. 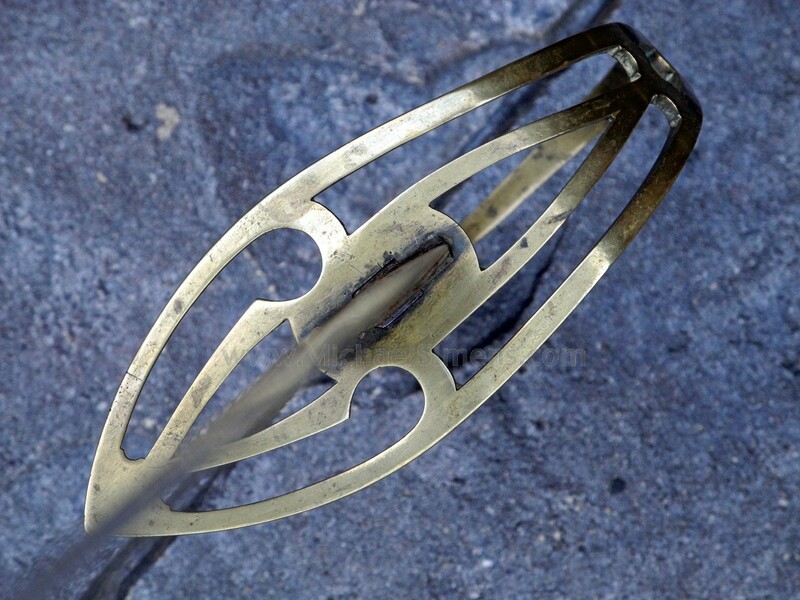 Stay tuned, and keep us in mind as a buyer of Revolutionary war weapons and artifacts.